Henry Wallace, who died 50 years ago this week (November 18, 1965), was one of the most fascinating and controversial political figures in American history. One of the great "what if?" questions of the 20th century is how America might have been different if Wallace, rather than Harry Truman, had succeeded Franklin Roosevelt in the White House. In fact, Wallace almost became the nation's president. In 1940, he was FDR's running mate and served as his Vice President for four years. But in 1944, against the advice of the Democratic Party's progressives and liberals -- including his wife Eleanor -- FDR reluctantly allowed the party's conservative, pro-business and segregationist wing to replace Wallace with Senator Harry Truman as the Vice Presidential candidate. Had Wallace remained as Vice President, he would have become president when FDR died in April 1945. In the late 1930s and early 1940s, only FDR eclipsed Wallace -- Roosevelt's Secretary of Agriculture (1933-1940) and then his Vice President (1941-1944) -- in popularity with the American people. Today, if Wallace is remembered at all, it is as a fringe candidate who ran on the Progressive Party ticket against Truman in 1948 and garnered less than three percent of the popular vote. That is unfortunate, because Wallace was a remarkable public servant -- a visionary on both domestic and foreign policy. He was, according to John Kenneth Galbraith, "second only to Roosevelt as the most important figure of the New Deal." These days, some political observers are comparing Bernie Sanders to Wallace. They both challenged the economic and political establishment of their time. But there are significant differences between these two men. Wallace ran for president as a third party candidate, guaranteeing that he'd be marginalized. Sanders is running as a Democrat, giving him great visibility on the campaign trail and in the media, including the televised debates. Like Sanders, Wallace was ahead of his time on most issues. He opposed the Cold War, the arms race with the Soviet Union, and racial segregation. He was a strong advocate of labor unions, national health insurance, public works jobs and women's equality. He would have been, without question, the most radical president in American history. He would have served out the remaining three years of FDR's fourth term and certainly would have sought to be elected on his own in 1948. The "what if?" questions are titillating but unknowable. Had Wallace become president, would the United States have dropped the atom bomb on Japan? Would the country have spent several decades engaged in a costly cold war and arms race with the Soviet Union? Would America have created a permanent war economy (one that President Eisenhower later warned had become a "military-industrial complex") and replaced England as the world's most assertive imperialist and colonial power, leading the country into numerous military adventures, including Vietnam? Would our society have postponed for at least a decade the civil rights and women's rights revolutions? As Adam Cohen recounts in Nothing to Fear (2009), his book on the first 100 days of FDR's administration, these experiences radicalized many farmers throughout the farm belt. In May 1932, for example, 2,000 farmers attended a rally at the Iowa state fairgrounds and urged fellow farmers to declare a "holiday" from farming, under the slogan "Stay at Home -- Buy Nothing Sell Nothing." In effect, they were urging farmers to go on strike -- to withhold their corn, beef, pork and milk until the government addressed their problems. They threatened to call a national farmers strike if Congress did not provide farmers with "legislative justice." In Sioux City, Iowa, farmers put wooden planks with nails on the highways to block agricultural deliveries. In Nebraska, one group of farmers showed up at a foreclosure sale and saw to it that every item that had been seized from a farmer's widow sold for five cents, leaving the bank with a total settlement of just $5.35. In Le Mars, Iowa, a group of farmers kidnapped Judge Charles Bradley off the bench while he was hearing foreclosure cases and threatened to lynch him if he did not agree to stop foreclosures. Wallace, a scientist and economist as well as a farmer, believed that the solution to the farm crisis was a combination of better farm management and government relief. Both Wallace and his father had been loyal Republicans, but in 1928, the younger Wallace changed his allegiance, supporting Democrat Al Smith for president. Four years later, Wallace endorsed FDR in the pages of his newspaper. Iowa, a traditionally Republican state, gave FDR almost 60 percent of its votes. Soon after winning the presidency, FDR recruited Wallace to become his secretary of agriculture. At 44, Wallace was the youngest member of the cabinet. Because the fate of American farming was closely linked to global issues -- particularly the export and import of food, but also hunger and famine around the world -- Wallace was well versed in foreign affairs. In the late 1930s, he became alarmed by the rise of fascist dictatorships in Germany, Italy and Japan. Many Midwesterners, including progressives, were still isolationists, but Wallace had become a vigorous internationalist and a strong advocate for "collective security" among the United States and its allies. The speech was Wallace's response to a 1941 article by Henry Luce, the publisher of Time and Life magazines, which called for an "American century" after the war -- meaning a century dominated by the United States, "to exert upon the world the full impact of our influence, for such purposes as we see fit and by such means as we see fit." Millions of copies of Wallace's speech were distributed around the world in 20 languages. It drew praise in liberal and progressive circles, but it also stirred controversy. The British prime minister, Winston Churchill -- who hoped that Britain would still have an empire to run after the war -- was upset by Wallace's stark anticolonial sentiments. American business groups objected to Wallace's views about economic imperialism. The New York Times and, of course, Luce's publications, thought it was too radical. The American fascists are most easily recognized by their deliberate perversion of truth and fact. Their newspapers and propaganda carefully cultivate every fissure of disunity... They claim to be super-patriots, but they would destroy every liberty guaranteed by the Constitution. They demand free enterprise, but are the spokesmen for monopoly and vested interest. Their final objective toward which all their deceit is directed is to capture political power so that, using the power of the state and the power of the market simultaneously, they may keep the common man in eternal subjection. Wallace's speech and his writings framed the debate between progressives and conservatives. Opponents viewed Wallace as naive, a dreamer and a radical. These opponents included influential Democrats who worried that FDR might anoint Wallace as his successor, or at least give Wallace a big enough stage from which to launch a presidential bid once FDR had retired. Led by Robert Hannegan, chairman of the Democratic National Committee, local and state party bosses quietly lobbied FDR to replace Wallace with Truman. 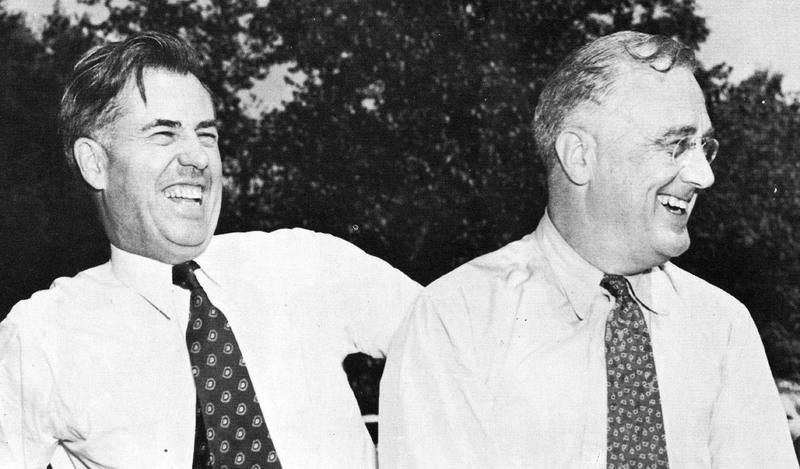 Going into the 1944 Democratic convention in Chicago, Wallace was strongly favored to keep his position as FDR's running mate. Too ill to attend the convention and too busy overseeing the American war effort to get in the middle of an intra-party battle, FDR let it be known that either Wallace or Truman (a little-known senator from Missouri with few accomplishments to his credit) would be an acceptable vice presidential pick. On the first ballot, Wallace beat Truman, but lacked sufficient votes needed to secure the nomination. Then the party's conservative influence-peddlers went to work making deals with leaders from different states to gain votes for Truman. They maneuvered successfully and handed Truman the nomination. Why didn't Wallace run against Truman within the Democratic Party, like Bernie Sanders is now running against Hillary Clinton to win the party's presidential nomination? In 1948, the party machinery was tightly controlled by urban bosses and Southern segregationists. There were no wide-open primaries, like we have today, where an insurgent like Sanders has a chance to build a grassroots following and win a significant number of delegates to the party convention. So Wallace campaigned for president on the Progressive Party ticket. On the major issues facing postwar America -- the cold war and the arms race (particularly the atomic bomb), strengthening New Deal social policies and boosting organized labor, and addressing segregation and racism -- Wallace believed that Truman was too cautious and conservative. He attacked Truman's support for loyalty oaths to root out communists and radicals from government jobs, unions, and teaching positions in schools and universities. He called for national health insurance, an expanded public works program, and reparations for Japanese Americans who had been interned during the war. He said it was time to elevate women to "first-class citizenship." And when Wallace campaigned in the South, he refused to speak to segregated audiences. On foreign policy, Wallace opposed the Truman Doctrine, which aimed to contain communism through military intervention if necessary. He refused to support the Marshall Plan to rebuild Europe, considering it an instrument of the cold war. He preferred a multilateral aid program that would be administered through the United Nations. Some early polls showed that Wallace had the support of more than 20 percent of the voters. Democratic Party officials, as well as some left-leaning union leaders, feared that even if Wallace could not win the election, he might attract enough Democratic voters that the White House would fall into the hands of the Republicans. Although his campaign initially attracted support from a wide political spectrum of liberals and radicals -- including high-profile figures like scientist Albert Einstein and singer and actor Paul Robeson -- much of that support soon withered as Wallace became closely identified with communists. Wallace believed in what would decades later be called "détente" -- finding ways to cooperate with the Soviet Union rather than getting trapped in a spiraling arms race. Even as cold war tensions were growing, Wallace simply did not subscribe to the anticommunist hysteria that emerged after the war. "I say those who fear communism lack faith in democracy," he said. In the 1948 contest, Truman beat New York Governor Thomas Dewey, the Republican candidate, in a historic upset. Wallace received only 2.38 percent of the national vote. He even trailed third-place Strom Thurmond, the Democratic governor of South Carolina, who was running on the segregationist Dixiecrat Party ticket. After this humiliating defeat, Wallace bought a farm in New York State, where he enjoyed working with plants and keeping chickens and made only occasional forays into public life. He was soon forgotten or reviled as a misguided radical. He died on November 18, 1965. It is easy to see, with 20-20 hindsight, that running as the Progressive Party's presidential candidate transformed Wallace into a marginal figure. But an honest examination of his 1948 platform reveals that most of the ideas for which he was condemned as a radical are now viewed as common sense. Peter Dreier is the E.P. Clapp Distinguished Professor of Politics, and chair of the Urban & Environmental Policy Department, at Occidental College. His most recent book is The 100 Greatest Americans of the 20th Century: A Social Justice Hall of Fame.